Finish Line is a top retailer of athletic footwear, apparel and accessories with a mission to deliver the Epic Finish, by bringing the latest and greatest sneakers to market and creating a memorable customer experience. Looking for something else! Shop and save with list of Finish Line offers, codes, in-store coupons, and more! Members Perks! Get an Extra 25% Off Select Sale Styles. Valid online only. Expires 1/17/19 at 10AM EST. 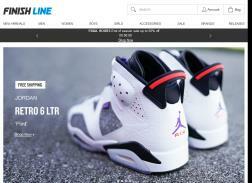 Extra 25% off Select Styles with code – Limited Time Only at Finishline.com! Great Deals Up To 50% Off End of Season Sale – Now at Finishline.com!